Do you enjoy listening to your favorite tunes when working out at the gym or running in the park, and are looking for a pair of decent if not the best workout headphones – which are durable, sweat-proof and produce exceptional and well-balanced sound? Then you’re at the right place ! 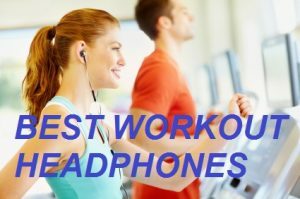 This is our workout headphones guide which includes the top 15 headphones for any sport and exercise activities. 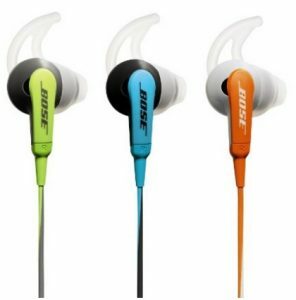 What are the features of high quality workout Headphones? First and foremost, you want your headsets to be water, or sweat, resistant. They also must be lightweight, durable and have a comfortable fit. The consideration of fit brings up the type of headphones that you may prefer. 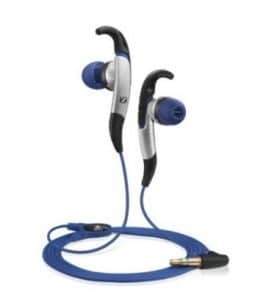 In general there are two styles, “in-ear” and “over-ear” headphones. The in-ear headphones are more likely to be an earbud style headphone. With the over ear headphones being the more traditional, on ear type of headphone. While the type may have some impact on the quality of sound, it really is a matter of personal preference and comfort. Over ear headphones tend to be larger and slightly heavier also. Their larger size may allow for a deeper sound, which is a key factor for audiophiles. The over ear headphones’ larger size may also make them slightly more durable and rugged. However, for regular exercise, particularly with more strenuous workouts, the bulkier over ear headphones and their additional weight may not hold the same appeal. That’s where the in-ear headphones stand out. Their lighter weight and smaller size make them a perfect companion for a longer run or an exercise routine that includes a lot of motion and exertion. While the choice remains one of personal preference, the form of the best workout headphones does have an impact on their function and best use. One of the last factors to consider is also one of the most important. That factor is Bluetooth or wired. The advent of wireless headphones, especially using Bluetooth connectivity, has been a major shift in the types of headphones that are available. Wireless headphones are now available in nearly every type and at every price point. The Bluetooth devices offer nearly every benefit that their wired counterparts have. They are able to pair with almost every mobile device and most of the Bluetooth headphones have buttons that will allow you to pause, skip or stop the music that you are listening to. Wireless headphones’ most noticeable benefit is that they are without wires. For those who work out with lots of dynamic movement or at a very fast pace, the placement of the wire can present some challenge. Bluetooth headphones will allow you to connect to your device without any wires between you. This allows you to run or move without any wires to consider or tangle. Most Bluetooth headphones have a range of 20 to 30 feet. This wireless connection would allow your device to be stationary, on the charger perhaps, while you moved around it. That is a great feature a wireless headphone device has over a wired one. Because the Bluetooth protocol requires a power source, all Bluetooth headphones have a battery built into their form. This is where wired devices have a clear advantage. A wired set of the best workout headphones can plug into almost any device at any point and begin functioning. A Bluetooth set of headphones has to have been charged first and then connected. As the technology continues to evolve so does the battery life. Many devices offer a relatively short period of time charging and can perform for as many as 8 hours on a single charge. However, in the event that the device is not changed the diminishing battery can limit the sound and have a negative impact on overall performance of the headphones. For those that forget to charge their devices or don’t have always have a charger, wired headphones would be a better choice. The final consideration of wired or wireless headphones is sound quality. Bluetooth connectivity has come so far that the higher end wireless headphones stand in direct competition with the wired headphones. Crisp highs and deep bass are available in either format and the volume can be cranked up until your heart’s content. However, in a full examination, there are still points at which the Bluetooth connection breaks up or “pops” during playback. These moments are typically brief and rare but it can happen. If you are a listener that requires uninterrupted, impeccable sound from their music, then the wired headphones may be your best bet. Like most choices, the best product is really a matter of which factors are the most important to you, the user. While a lightweight wireless set of headphones may work for one person, the other may require ten uninterrupted hours of playback which would almost force them to consider a wired option. Bose is one of the premier names in the speaker industry. Their name is synonymous with great functionality and fantastic sound quality. These headphones are no exception. They are a wired set of headphones that are specifically designed for Apple brand products. These plug into a 3.5 mm port on your iPhone, iPad or other Apple brand device and allow you to use the wired remote to access the device playback functions. These headphones feature an in-line microphone and remote allows you skip between tracks, pause playback, or, if the device is capable, accept calls all with the touch of a button. The SoundSport headphones are Bose quality headphones. That means you are sure to enjoy premium sound and sound quality from this device. Their patented TriPort technology drives a sound that has sharp highs and full lows. The headphones are a wired device which benefits from a continued, uninterrupted connection to your device and the music that you’ve selected. From the time that you begin playback, the SoundSport provides excellent sound that completely surrounds you. These headphones are designed with exercise in mind. They are comprised of water and sweat resistant fabric, but also designed to fit in your ears and remain there during a vigorous workout. Bose’s StayHear tips conform to the shape of your ear, in a way that was both comfortable and effective. They didn’t slip or fall out of my ears at all, despite any sweat that accumulated, which is a big consideration. The lightweight construction of these headphones plus the great fit and amazing sound makes them a great choice for an Apple device user in search of a wired set of headphones. JayBird has made their name in the Bluetooth headphone market. They provide bluetooth headphones for the casual and active user, as well as a new activity tracker to monitor your fitness activity and heart rate. Their BlueBuds X product is the culmination of several years of development and continued improvements. The biggest development is the use of JayBird’s Shift premium Bluetooth Audio. JayBird has refined the use of Bluetooth protocol to deliver a rich, premium sound. Where some Bluetooth headphones may have a flatter sound, the BlueBuds X provides a rich sound with warm bass. In addition to the improvement in sound quality, the BlueBuds X have the SignalPlus feature which is designed to prevent any drop in signal and resulting loss in sound. These significant improvements to the BlueBud X make it a great Bluetooth device. As with most of their Bluetooth offerings, JayBird includes a microphone which means the best workout headphones can be used as a handsfree device for your mobile phone. The BlueBuds X pair with any Bluetooth enabled device and have buttons built into the device to allow you to pause, skip or rewind playback as well as take calls and adjust the volume. Bluetooth headphones uniformly suffer from challenges as it relates to battery life. The need to keep the devices compact and lightweight has resulted in compromises to the size of the battery. The BlueBuds X has made great strides in that area. The BlueBuds X has the longest battery life for continued play that I’ve experienced. On a full charge, the JayBird BlueBuds X goes for 8 hours of continuous play. That’s nearly double the battery life of their previous Bluetooth headphones. The JayBird BlueBuds X are a small Bluetooth headphone set that is designed for an active lifestyle. They are sweat proof and have great sound quality. The SignalPlus technology and the extended battery life make this a great set of Bluetooth headphones. Beats by Dre changed onto the scene and changed the way most consumers looked at headphones. The premium headphone company provided industry leading sound while also becoming a desired fashion accessory. The Powerbeats 2 wireless is the Bluetooth sports model of the Beats by Dre headphone line. 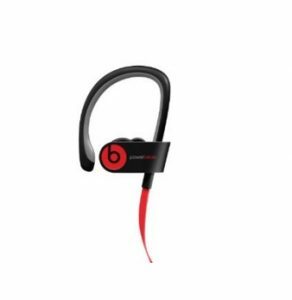 These are equipped with the expected Beats sound, a rich bass with nuanced treble and great volume. Using dual driver acoustics, these headphones create a powerful sound in any environment. They perform at the top of their class and allow the user to have a premium sound experience with the benefits of the Bluetooth connection. Wirelessly connecting to your favorite Bluetooth enabled device, the Powerbeats 2 are a powerful set of headphones. 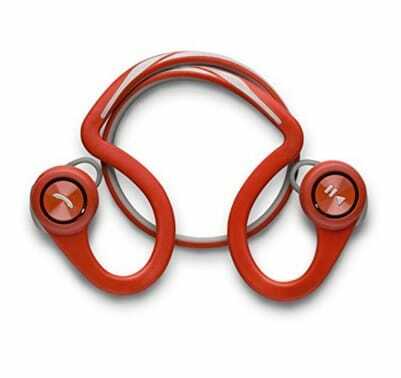 The Powerbeats have a unique form which allows them to stay in and on your ears during a long run or arduous work out. The Beats by Dre headphones fit in your ear, while also providing a flexible over the ear hook to create additional security. This comfortable but firm inclusion means that the Powerbeats have a great fit on your ear and hold well. They are also sweat proof with means that this lightweight headphone set is immediately ready for use during your best work out. The Powerbeats have one limitation though, which is common with Bluetooth headphones, and that is the battery life. These Beats by Dre Bluetooth headphones are said to have a 6 hour continuous playback. While this does provide some limit on how much you can use the headphones, they also have a very quick recharge time. The Powerbeats can be fully charged in about 15 minutes. The Powerbeats 2 Wireless overcome their limitations with their trademark sound and secure fit. They are designed for use by people in motion and their performance meets that expectation. Plantronics is an esteemed brand which has provided quality headsets and headphones for use with communications devices for years. From traditional wired headsets with wrap around microphones to the latest in Bluetooth headphones, Plantronics has consistently offered durable products that perform well. The BackBeat FIT headphones are no exception. These Bluetooth headphones are designed by Plantronics with exercise in mind. They feature a behind the ear and wrap around design that secures them in your ear and keeps them in place on your neck, ideal for physical activity. They are composed of a very flexible, almost rubbery material that feels very rugged and durable to the touch. They even feature a Plantronics exclusive ‘nano-coating’ to make the earpieces water repellant to endure sweat, rain or even a quick spill. This Bluetooth headset is compatible with any Bluetooth enabled device, and as with many of the Bluetooth headphones, includes a microphone to allow hands free calls from your mobile phone. The BackBeat FIT headphones include built in buttons to allow you to control playback of the media from your device and accept calls with the touch of a finger. The BackBeat FIT has the standard Bluetooth range of about 30 feet from the connected device. In addition, the Plantronics device offers a full 8 hours of continuous playback time on a full charge. As with all headphones, the ability of the device to produce a quality sound is key. The BackBeat FIT has a good sound quality and nice volume. 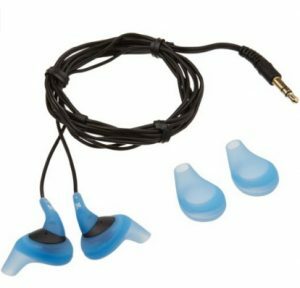 The earpieces require a bit of adjusting to create a seal against your ear, but once fitted, the BackBeat FIT produces a nice bass note along with good, clear highs. There is a difference between this device and some of the more premium headphones, both wireless and wired, but for a user that’s most concerned about durability and battery life, this is a great Bluetooth headphone device. Freedom is another Bluetooth headphone product from the trusted manufacturer JayBird. The Freedom is the entry level sports Bluetooth headphone. It is consistent with their quality products and offers many of the same great benefits. The Freedom are a Bluetooth headphone device that pairs wirelessly with your Bluetooth enabled device. Like the BlueBuds X, the Freedom also offers a built in microphone which allows you to make hands-free calls. The Freedom has buttons built in to the device to pause, skip and control music playback and make and end phone calls. While the headphones are connected wirelessly, the range is slightly less than some comparable devices. 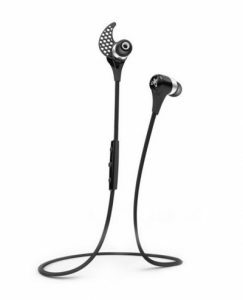 The Jaybird Freedom headphones function well within about 10 to 15 feet of the device. The JayBird Freedom is set of sports headphones that are constructed with an active lifestyle in mind. The headphones are secured to your ears via earbuds that are placed inside your ears. The packaging includes Secure Fit strips that are designed to hold the headphones in pace. The Freedom headphones are worn around the neck, with a very lightweight structure. They are easy to wear and stay in place during jogging and running. In addition, the Freedom are sweat proof and backed by a lifetime warranty. The Freedom are an entry level offering from JayBird. As a result there is a clear difference between this and some of the more premium offerings, even by JayBird. The Freedom are a fully functioning Bluetooth set of headphones. However, they have a slightly lesser range and battery life that their premium counterparts. In addition, the Freedom provide clear and adequate quality sound, but still diminished from some of the options available at a higher price point. These are a good option for the budget conscious shopper who needs a Bluetooth headset for his exercise routine. The SoundPeats Qy7 headphones are a set of wireless headphones from SoundPeats a relatively new contender in the headphone market. SoundPeats offers both wired and wireless headphones and speakers to use with your mobile device. These headphones are a mid-level entry into the market, but offer a nice set of benefits. The Qy7 headphones are a set of wireless headphones designed with sports in mind. The SoundPeats headphones connect via Bluetooth to your Bluetooth enabled mobile phone or tablet. The Qy7 headphones feature a single button on one earbud that allows users to adjust the volume or skip tracks with a series of button presses. In addition, when connected wirelessly the Qy7 can be used to make and accept hands free calls from your mobile phone. 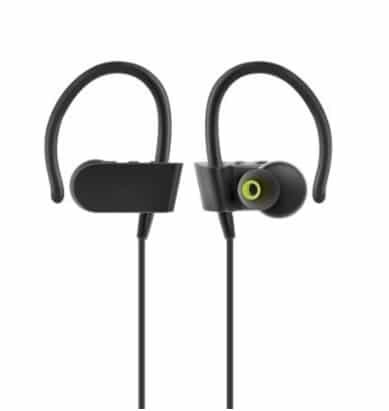 The SoundPeats Qy7 are a light and durable construction that feels tough enough to last through a more rigorous workout. The headphones are designed with athletes and their performance in mind. They are sweatproof and rugged. The Qy7 have a battery life of about 5 hours for continuous playback and talk time on a full charge. Like some other wireless headsets, the Qy7 does have a USB charger and allows a quicker charge time. While the Qy7 are considered a mid-level offering, they do provide a great quality of sound. With the right size tip securing the earbud into your ear, you can easily hear the full bass and sharp highs of your favorite tunes. The great sound is a nice addition to a good set of features on the SoundPeats Qy7. The biggest benefit of the Qy7 is the low price point. These headphones are a great option for the reduced price for a consumer interested in a quality set of Bluetooth headphones. 66 Audio is a manufacturer that offers wireless audio technology with an emphasis on active users. Their BTS Sport is a wireless headphone device that blends the over the ear design with a in the ear structure. While the rubberized frame goes behind your head, two soft earpieces cover your ears. The BTS Sport has a very similar look to the traditional over the ear headphone. But after appearance, that’s where the comparisons stop. The 66 audio headphones use the latest version of Bluetooth to ensure a clear connection with any Bluetooth enabled device. From your smartphone, tablet or even gaming device, the BTS Sport headphones are able to connect and control playback with buttons for pause, play and skip or rewind. Additionally, the BTS Sport headphones can also make or end calls while connected to your mobile phone via Bluetooth protocol. 66 Audio emphasizes that their products are all designed with an active lifestyle in mind. The BTS Sport continues that aesthetic. It is lightweight and has a durable feel to it. The fit of the earpieces over the ears is snug enough that it could stay in place even when moving through a serious workout. The other substantial benefit to the modified form is the additional battery capacity. The BTS Sport has an incredible 30 hours of continuous playback when fully changed. And the best workout headphones are rated with more than 500 hours of standby time. The over the ear design of the BTS Sport allows for a larger driver and more powerful sound from the headphones. This provides a deep, low bass and sharp high notes, giving the BTS a premium quality sound. Paired with the extended battery life and the comfortable fit, the BTS Sport headphones are a great product for those who exercise in a controlled area and can afford to be truly immersed in their music. Photive is a newer company that has come onto the scene. Their products include headphones, speakers, portable chargers and cases for your mobile devices. 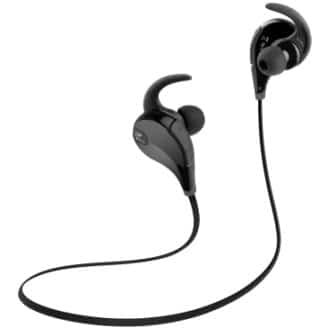 Their PH-BTE70 are wireless headphones that are similar to the Powerbeats 2 in appearance. They have the flexible rubberized piece that goes over the back of the ear, while the earbud fits snugly inside the ear. This styling assures that the PH-BTE70 will stay in place during running or extreme movement. This construction is both durable and comfortable for long wear. In addition, it also provides a great channel into the ear for the quality sound the Photive device produces. The Photive PH-BTE70 are a Bluetooth set of headphones that will connect wireless to your mobile phone, music player or selected device. By establishing this connection, you are able to control the playback with buttons that are built into the side of the headphones. In addition, when connected with your mobile phone, the PH-BTE70 can be used to place a convenient hands free call. Because they are connected via the latest in Bluetooth protocol, the Photive headphones have an impressive range and more efficient battery use than similar devices The Photive headphones are effective at a range of more than 30 feet. They also are able to function for up to 6 hours of continuous playback on a full charge. The final factor for any headphones is the sound they produce. The Photive PH-BTE70 have an advanced sound driver that produces a high quality sound. Once the earpieces are comfortably aligned with your ears, prepare yourself for a great sound experience. The dynamic bass output is well matched with the clear high tones. For a runner or active person who is in search of a high quality alternative to some of the pricier headphones, the Photive PH-BTE70 are a great option. These are another great entry from Bose, one of the foremost brands in personal sound technology. The SIE2i Sport headphones are a wired set of headphones designed for an active lifestyle. They are a small, extremely light set of earbuds that can be placed right inside the ear for a comfortable fit. These headphones are designed to fit securely and stay in place. The SIE2i is, like many of the devices reviewed, also able to be used as a hands free device for your mobile phone. Once connected to your device, there is an inline remote and microphone that you can use to accept or end the call as needed. As a wired set of headphones the SIE2i does not need a battery or charging port. However, the inline remote does allow you to control the replay in addition to managing any calls that you should take. 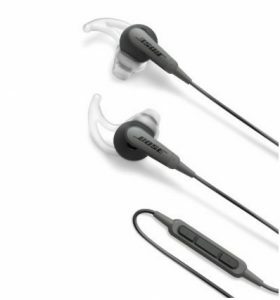 The SIE2i is the predecessor to the Bose SoundSport headphones. One of the biggest differences between the two is that the SIE2i is not so geared towards Apple devices. These Bose headphones are available in four colors: green, orange, blue or purpose. As a Bose product, the SIE2i has a great reputation to live within. Bose products have a record for unparalleled sound and function. The SIE2i uphold that tradition very well. They have a full range of sound that matches to any type of music. These headphones employ the Bose TriPort technology which delivers a very wide range of sound. That includes clear treble tones and full and resonant bass. The SIE2i are a great product in the Bose tradition. They are the perfect headset for an active user looking for the Bose quality in a wired device. MEE audio began creating portable audio technology about 10 years ago. What they began as a venture of love continued as they manufactured headphones designed to perform at a high level in changing conditions. 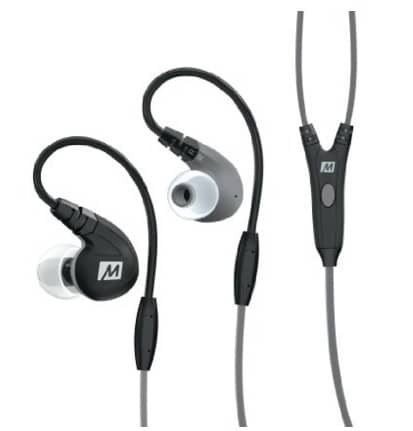 The M7P headphones are a result of their efforts. These wired headphones are designed to survive the weather and the rigors of a long work out and still function at peak capacity. Their behind the ear flexible ‘earhooks’ combine with earpieces that fit in your ear for a comfortable fit and great seal. These two elements easily support the weight of the headphones and secure them in place for even the most active workouts. In addition, MEE audio adds their Liquipel Watersafe nanocoating to protect the device against sweat and the elements. The M7P headphones are personal audio technology with a sports focus. With that in mind, it’s important that they are able to perform on the audio end of the spectrum. Their comfortable and secure fit ensure that the sound is carried directly into the ear. And that sound is clear and resonant with full bass and nice treble. The MEE audio M7P headphones also include an inline remote and microphone with allows you to control the playback of your music and take calls from your mobile device. This hands free functionality is an added bonus on headphones that already have such a great performance. As wired headphones, the MEE audio M7P headphones perform very well. They don’t require any charging or power source. They also do not have any lag or break up in the connection between the device and your ears. The M7P can connect to any device that has a 3.5 mm headphone jack such as a mobile phone, mp3 player or tablet. Their innovative design and great sound quality, in addition to their sweat proof construction, make the M7P a good selection for someone in the market for a quality set of headphones. JVC is one of the largest manufacturers of electronics and accessories for your home, car and mobile devices. Their products, particularly their stereos, have a great reputation for quality and performance. Their HAEN10A is a great take on a very basic, entry level sports set of headphones. These headphones are of very lightweight and designed to fit in your ear. Their branding features the word ‘Gumy’ in reference to the soft, flexible silicone earpieces that fit directly into your ear to create a snug seal. 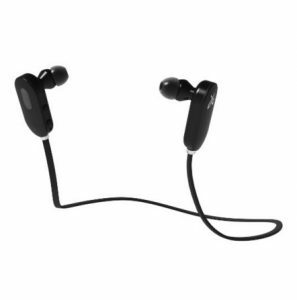 These ‘Gumy’ earpieces come in two different sizes and provide great support for the JVC headphones. The HAEN10A are a set of wired headphones that connect to your preferred device via a 3.5 mm headphone jack. 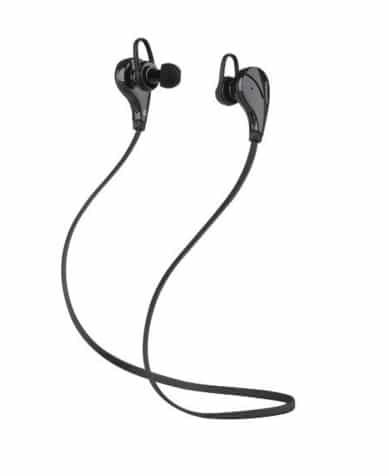 Once you’ve queued up the ideal work out mix and plugged in the best workout headphones, the JVC devices provide a surprisingly rich sound for an entry level set of headphones. They have great bass reflex and solid treble. Though the some of the high notes take on a slight distortion, in general these JVC headphones have a quality sound. Their performance is aided by the ‘Gumy’ earpieces and their tight fit. JVC HAEN10A is a wired set of headphones with all the expected benefits of a wired format. These headphones function without a need to charge or without any static or ‘pop’ in the playback of your chosen soundtrack. However, as an entry level device they do not include some of the other features you may have come to desire. The HAEN10A Gumy headphones are strictly headphones. They do not include any inline control for the device or microphone to allow hands free talking. However, for a consumer who desires a simple presentation and basic functionality, these JVC headphones are a quality product which are available at a very affordable price point. Sennheiser is a German manufacturer and a very reputable brand known for their high quality headphones, microphones and audio technology products. The CX 685 sees Sennheiser paired with Adidas, one of the top makers of athletic apparel. This pairing results in a wired headset that is geared for top athletes and sport enthusiasts. The CX 685 seeks to capitalize on Sennheiser’s reputation for audio products and sound quality as well as Adidas brand presence in the sports world. This collaboration is successful. The CX 685 headphones are a comfortable, secure headphone set that goes in your ear. The ear tips rest firmly and comfortably in your ear and the designed ‘earfin’ holding system secures the headphones in place. 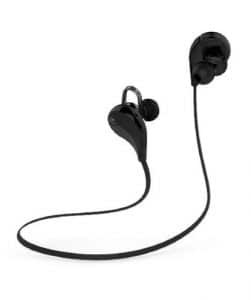 In addition, because these are sport headphones, the connections have been reinforced and the headphones themselves have been sweat proofed to provide a rugged and durable feel. The CX 685 are a Sennheiser product which equates to great expectations in terms of sound quality. And they perform up to expectations and beyond. These headphones produce a premium quality sound from your chosen mobile device, mp3 player or tablet. The CX685 have an acoustically closed design that makes them ideal for indoor workouts. This design excludes exterior noise allowing you to focus on the clarity of the highs and the warmth of the low tones. This is the place where Sennheiser’s role in the collaboration shines. The CX 685 are a wired headset. They do not require a power source and are ready to use as soon as they are plugged into your selected device. Though these are definitely a well-designed, high quality set of headphones they do not include an inline remote or microphone. These headphones are designed to be used while you train, and to keep your focus on training. 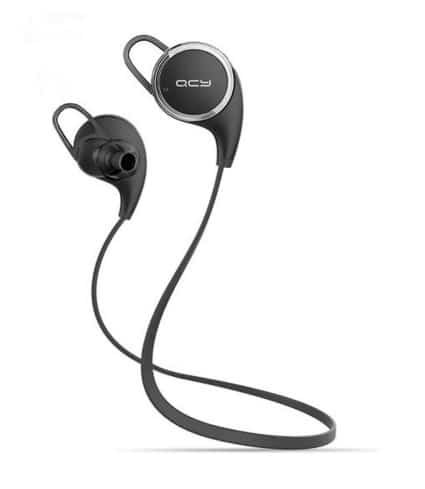 At this price point, the CX 685 are headphones that have a great performance when working out and provide an excellent sound. A great purchase for an athlete who wants to truly enjoy their music while they train. Intcrown is one of the newer manufacturers releasing their headphones onto the market. 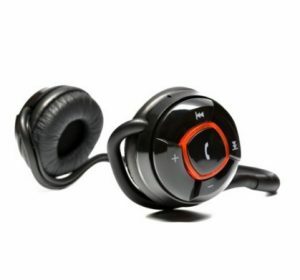 This particular product is a set of wireless headphones designed for sports and active lifestyles. The S520 headphones are an entry level headphone set designed to fit into your ears while the wire rests around your neck. The in-ear portion is supported by soft plastic tips that pad the best workout headphones while the rest in your ear. The overall headset is extremely lightweight, such that once the earbuds are inserted into your ear, the headphones are practically unnoticeable. As a wireless headphone set, the Intcrown S520 connect via Bluetooth with your Bluetooth enabled device. If you work out using a mobile phone, tablet or mp3 player you can wireless connect the S520 and listen to music without any cords or wires within a range of more than 20 feet. The S520 features on board controls which will allow you to adjust the volume and control the playback of your music, as well as take calls from your mobile phone. The biggest limit to the function of the S520 is the relatively short battery life. The headphones are rated to last 4 hours on a full charge. The Intcrown S520 set of headphone is a basic offering for a runner. As headphones, they provide an above average sound. While there is some loss of quality at higher volumes, the S520 functions well at normal volumes producing decent highs and deep low tones. Their very light design is a nice benefit as well. For an active person interested in trying a Bluetooth headset without investing in one of the premium brands, the S520 is a solid entry level pair of headphones with good performance. Manufacturer Matone specializes in consumer electronics and mobile phone accessories. Their release of the QY8 is an update of their successful QY7 which is a wireless headphone. The QY8 is a pair of headphones designed with motion and rigorous activity in mind. These headphones are light and sweat proof, but also well-constructed and feature a few options to secure the earpieces in your ear while moving. The QY8 is an in ear set of headphones that use soft silicone ear pieces to create a comfortable but also snug fit. Once fitted into your ear, the wire drapes against the back of your neck. The Matone QY8 headphones are a set of wireless headphones. The QY8 connects to your tablet or mobile phone via the latest Bluetooth protocol. This allows you to run or exercise in any way with no wires to tangle or cords to compete with. As long as you stay within about 30 feet of your device, the music will pump through without any interruption. The QY8 have controls built into each earbud which allows you to adjust the volume and control the playback of your music. In addition, they also feature a button which will allow you to accept and end calls from your mobile device, making the QY8 a great hands free accessory as well. The battery life from the headphones is also solid. They are rated at 6 hours of continuous use on a full charge. As with any headsets, the QY8 is only as good as it sound when the music’s coming through. The QY8 renders a great performance and solid sound quality without any distortion. They produce a full deep bass tone and crisp treble notes as well. When the best workout headphones are secured in your ears, you can enjoy a jog or even high intensity exercise from these Bluetooth headphones without any difficulty.